WASHINGTON (CNS) — Pope Francis personally appealed to President Barack Obama and Cuban President Raul Castro this year to encourage both leaders to normalize diplomatic relations, a senior Obama administration official said. Speaking on background, the official told reporters Dec. 17 that the pope followed up the personal appeals with letters to the U.S. and Cuban leaders, encouraging them to move forward on efforts to improve relations between the two countries. The pope’s actions were part of a major diplomatic effort by the Vatican, which hosted direct talks between American and Cuban officials, the administration official said. “That (letter) gave greater impetus and momentum for us to move forward,” the administration official said. Castro and Obama acknowledged in simultaneous addresses to their respective nations the role Pope Francis played in the talks. In a statement released after the announcement was made simultaneously by Obama in Washington and Castro in Havana, the Vatican confirmed the pope’s role in negotiations between the two countries. “The Holy See will continue to assure its support for initiatives which both nations will undertake to strengthen their bilateral relations and promote the wellbeing of their respective citizens,” the statement said. The pope had appealed to both countries for the release of Alan Gross, an American contractor for the U.S. Agency for International Development, who had been held in a Cuban prison for five years. Gross was released Dec. 17, hours before Obama announced that change in U.S. policy toward Cuba. The administration official also said that a U.S. “intelligence asset” was being released after being held for 20 years in Cuba in exchange for three members of the Cuban Five, or Miami Five as they are also known. The official declined to identify the U.S. spy. The men were members of a Cuban intelligence network in Miami known as “La Red Avispa,” or “Wasp Network,” dispatched by Cuba’s then-President Fidel Castro in the early 1990s to infiltrate militant exile groups in South Florida, according to the Associated Press. 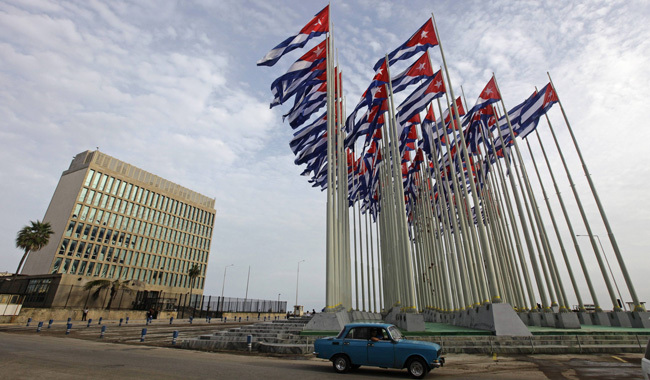 The administration official told reporters that with the changes, the U.S. would continue to pursue efforts to promote democracy and strengthen human rights in Cuba. “Openness is a better policy than isolation in advancing the things we care about in Cuba,” the official said. The official laid out a timeline that indicated that talks between the U.S. and Cuba took about 18 months to evolve to the point where Obama announced a change in the American position regarding its Caribbean neighbor. The officials said talks mostly took place in Canada with one meeting occurring at the Vatican. Obama said in a noontime address that the U.S. and Cuba would begin talks to normalize relations and open an embassy in Havana for the first time in more than 50 years. Diplomatic relations between the two countries ended in 1961. “President Obama has enormous respect for Pope Francis and his personal engagement is important to us,” the official added. Senior Vatican officials later received U.S. and Cuban officials together in October. The meeting gave representatives of both countries the opportunity to review details of their negotiations and formalize the exchange and transfer of the prisoners. The administration official stressed that Gross’ release was a humanitarian gesture by the Cuban government and was not tied to the prisoner exchange. The official said the Vatican was the only government directly involved in talks between the two countries. Canada hosted meetings between the two governments during, but Canadian officials did not participate. The Cuban Five were arrested Sept. 12, 1998 by a heavily armed FBI SWAT team. They were convicted in 2001 in Miami on charges including conspiracy to commit murder, acting as an agent of a foreign government, and other illegal activities in the United States and failure to register as foreign agents in the U.S. and other illegal activities. Each was sentenced to four life terms plus 75 years in December 2001. They are hailed as national heroes in Cuba, according to AP. The five appealed their convictions. A three-judge panel of the 11th U.S. Circuit Court of Appeals overturned their convictions in 2005, but the full court later reversed the ruling, ending the five men’s bid for a new trial and reinstated the original convictions. In June 2009 the U.S. Supreme Court declined to review the case. Two were eventually released, one in October 2011 and the other in February of this year.